The Alaska Range (a portion near Delta shown above) extends 650 miles in an arc from Lake Iliamna at the southwest end to White River in Canada at the southeast end. The highest point of the Alaska Range is Mount McKinley (Denali), the highest peak on the North American continent, at 20,320 feet. The higher elevations of the mountains of the Alaska Range remain snow-covered throughout the summer months. The peaks of Granite Mountain are usually free of snow by early June. Granite Mountain, also in the Alaska Range, is 5,815 feet high and extends NW 15 miles from Gerstle River, 20 miles SE of Delta. The local descriptive name was reported by the United States Geological Survey in 1949. Panoramic Peak, reaching 5,150 feet on the north slope of Granite Mountain, is 19 miles SE of Delta. Shovel Point Horn, a 5,100-foot pinnacle on Granite Mountain, is near the head of Rhodes Creek, 20 miles SE of Delta. The latter two were named by T.L. Pewe of the USGS. Donnelly Dome, with an elevation of 3,910 feet, is just west of the Richardson Highway 18 miles south of Delta Junction. The climb to the top of Donnelly is not easy, but has been accomplished by many local residents. The Dome’s name was established in the 1920s and derived from the name of a highway worker. Prior to then, it was called ‘Delta Dome’, named after the Delta River. The mountains of the Alaska Range are sketched as they look from local vantage points. Mount Shand is 12,600 feet, at the head of Trident Glacier, 10 miles SE of Mount Hayes. It was named for William Shand Jr., (1918-46), reported to be one of a party of two that made the first ascent of nearby Mount Moffit on August 13, 1941. Bradford Washburn proposed this name in 1949 to be applied to what is now called Mount Moffit. The present application of the name was suggested in 1961 by USGS to resolve the conflict of two names applied to the same feature. Mount Moffit, at 13,020 feet, is near the head of Trident Glacier and 11 miles SE of Mount Hayes. It was named in 1950 by the USGS for Fred Howard Moffit (1874-1958) who worked in Alaska for 40 years and authorized over 40 publications on Alaska geology and mining. It was first climbed by the Shand party. Aurora Peak rises to 10,065 feet and is also near the head of Trident Glacier. It is 8.6 miles SE of Mount Hayes. 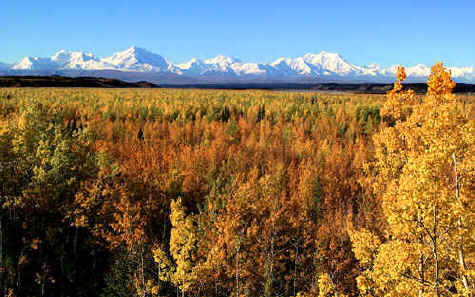 Mount Hayes (at right) is the tallest of the Alaska Range mountains visible from Delta Junction. It rises to 13,832 feet at the head of Hayes Glacier, 43 miles SW of Delta. The peak was named in 1898 by W.J. Peters and A.H. Brooks, USGS, for Charles Willard Hayes, geologist with USGS from 1887 to 1911. 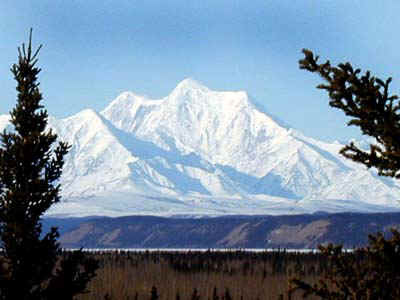 The first ascent of this mountain was made on August 1,1941. Hess Mountain is 11,940 feet high. It is three miles east of Mount Deborah and 53 miles east of McKinley Park. The peak was reported by the USGS in 1912. The mountains around the Delta area provide spectacular panoramas of scenic grandeur. One of the better viewing points is the turnout across from the Federal Aviation Administration facility halfway between Delta Junction and Fort Greely A drive through the Clearwater area will also produce good views of surrounding peaks, as will a short journey on the Richardson Highway south of Fort Greely The mountains visible here are all part of the Alaska Range.